From Scott McCloud’s, “Understanding Comics” pg. 21. Commentary on the adaptability of comics. Have you noticed the prevalence of comic book characters in our everyday lives? From movies to T.V. shows to even toys, it seems as if the popularity of comics and their ensuing characters has skyrocketed. One thing we can blame for this sudden increase in popularity is ease of access. The digitalization of comics has led to the sharing and popularization of this previously overlooked form of media. 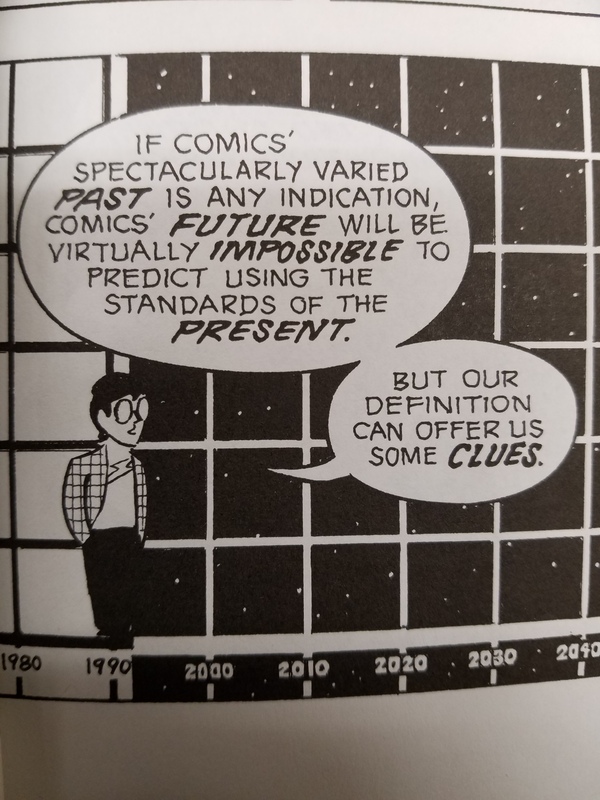 Scott McCloud predicted the changeability of comics in 1990 and it can’t be denied. Look at the how much the internet has grown and consider the types of media, like comics, it changes and popularizes. The internet is present in nearly every aspect of our modern day lives. It is strange to find a person without some form of access to the internet be it through personal smart phones, computers, or places like a local library. The internet has become a necessity, budgeted for like electricity, water, or food. This cost is well worth it as the internet gives people around the world access to nearly infinite information. No longer do people have to carry around a dusty tomb of a book, they can just whip out their smartphone to do the job. This ease of access can lead to some interesting questions about the validity of older models of information storage, like books. If everything is on the web, what is the use of print? This debate is more of a matter of preference at this point, as access to print and web-based media is still essentially even. However, in a fast-changing world how much longer will this last? My prediction for the future is that more and more media, and specifically comics, will be digitalized. This is due to such conveniences as ease of access and how we consume media in shorter and shorter burst of information. Even the model of distribution to the public changes format when digitalized. People can now look up their favorite types of stories on the internet instead of having to search relatively limited physical collections in stores or libraries. However, this does not say that digitalization does not leave the content of comics unchanged. Some for the worse, and others for the better. People make comics differently than how they did in the past. It is much more convenient to have files stored in the cloud or other access devises for the sake of not only portability but changeability. As well, the creation of this media changes too. Drawing in traditional pen and pencils leave some room for change to the actual creation, but in digitized media the entire piece can be changed at the press of a button. As well, the layout and consumption of digital media can differ. Creators do not have to worry about page length restrictions or even have to fit their art onto the traditional 8x11in size of paper. In return, putting comics online give less control to artists on how their art is viewed, either in sequence or in form. Reading in print vs. digital media for comics is different as well. The physical nature of turning a page can be soothing, but I would argue that for comics it is more disruptive than cathartic. The art/story is momentarily stopped in print. However, in digital media, the comic flows at the press of a button. Analyzing the difference between reading Scott McCloud’s “Understanding Comics” in print and his further web comics online is an interesting task. In print most of the pages are filled to capacity, the size of the comic boxes changes but the rectangular border box is very prevalent, and page flipping can lead to disruption of the story. In McCloud’s web comic the comic border is still used but noticeably missing, a webpage is not noticeably filled to capacity from left to right, and the use of scrolling makes for a more seamless enterprise. Overall these differences in perspective for the reader are not deal breakers, however, the availability of comics to readers certainly is and can attest for comics new found popularity. 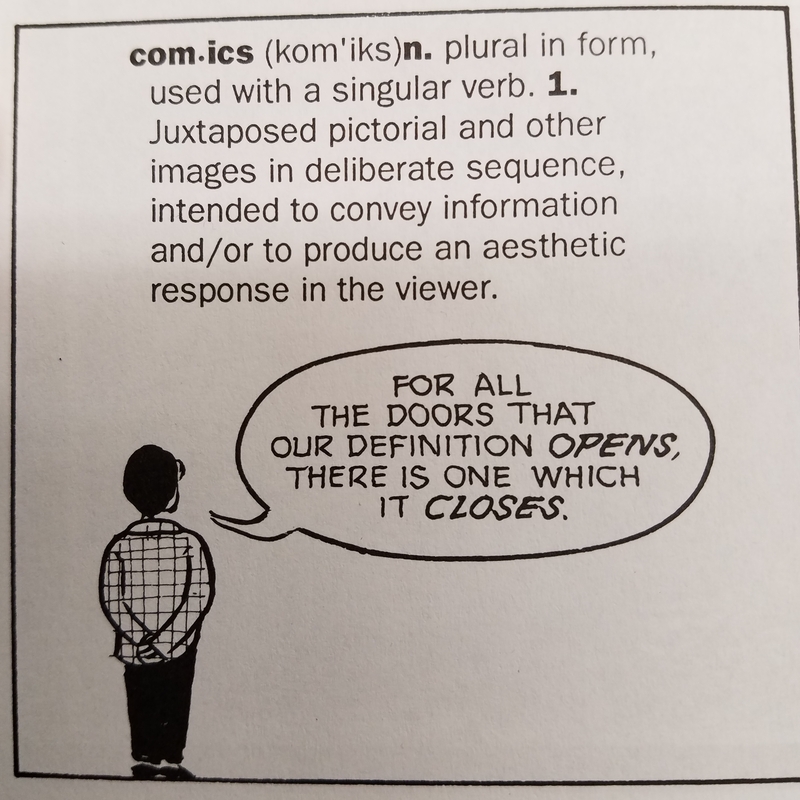 From Scott McCloud’s, “Understanding Comics”, pg. 20 Definition of comics and their limitations (in single panel form).